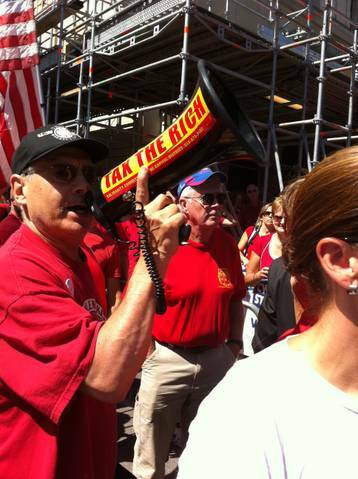 On Aug. 6, 45,000 members of the Communications Workers of America (CWA) and the International Brotherhood of Electrical Workers (IBEW) went on strike against communications giant Verizon from Massachusetts to Virginia—the largest private sector work stoppage in the last seven years. Around 1,000 of those workers are in Central New York. Workers were forced into the strike action after Verizon refused to drop a long list of demands amounting to over $1 billion in concessions. These concessions include the freezing and elimination of pensions, reduction in health care benefits, replacement of an objective wage-increase scheme by a subjective one dictated by management and the elimination of paid holidays and sick days. Verizon reported $10 billion in profits in 2010 and net income of $6.9 billion during the first half of this year alone. CEO Ivan Seidenberg, who is by definition not a worker, has been paid over $81 million dollars between 2007 and 2010. This is 300 times what an average worker earns at Verizon. These two unions walked out in 1986, 1989, 1998, and 2000 to maintain decent employer-paid medical coverage - in 2003 and 2008, they waged militant contract campaigns over the same issue, narrowly avoiding a strike. Some of these strikers remember the epic battle 22 years ago against NYNEX, a predecessor of Verizon that operated in New York and New England. In one of the few successful anti-concession campaigns of the 1980s, 60,000 IBEW and CWA members stayed out for four months to fight against management demands for premium sharing. Two union members died as a result of that struggle. Scores were arrested, more than 250 were fired or suspended, and all employer-paid health insurance was cut off by NYNEX, to pressure workers and their families into a concessionary settlement. In times of economic crisis, the class divide in society sharpens. We support these striking workers who are standing up for not only their rights, but for the rights of the working class as a whole. Having just witnessed a massive, bi-partisan assault on the working-class under the guise of a “debt deal,” the bravery of Verizon workers is all the more important.